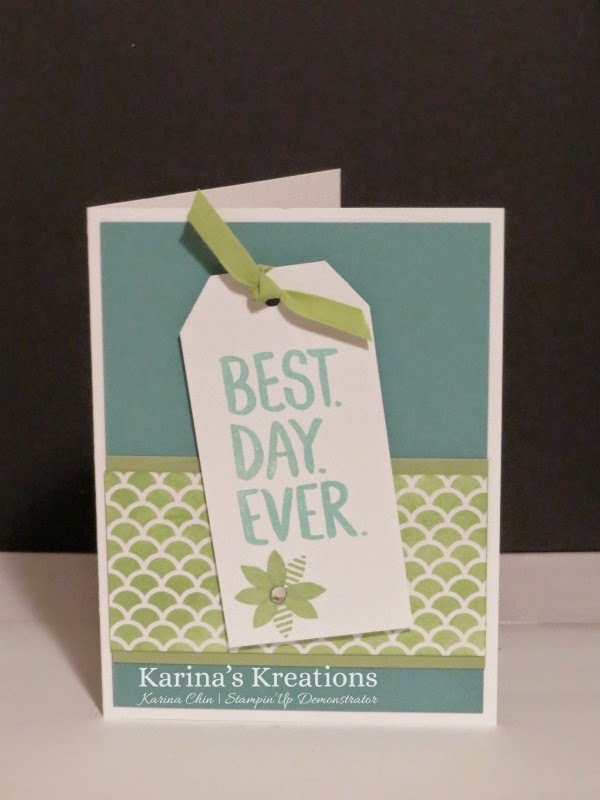 Karina's Kreations: Best Day Ever Sale-a-bration Card! Best Day Ever Sale-a-bration Card! I made this cute card using the best day ever sale-a-bration stamp set. The card stock colors are Lost Lagoon, Pear Pizzaz and Costal Cabana. My favourite part of the card is the Pear Pizzaz sponged DEsigner Series Paper called Irresistibly Yours and is a free sale-a-bration item. The back ground is embossed with white on white card stock. You can change the color of your card stock to match your project by sponging it with ink, spritzing it or coloring it blendabilities markers. It's so easy!!! By stamping the flower image twice and overlapping it, you get an 8 petaled flower. I still have a few spots in my 16 card birthday bash extravaganza on the Jan 25th! Email me at kchin2@telus.net to book your spot.